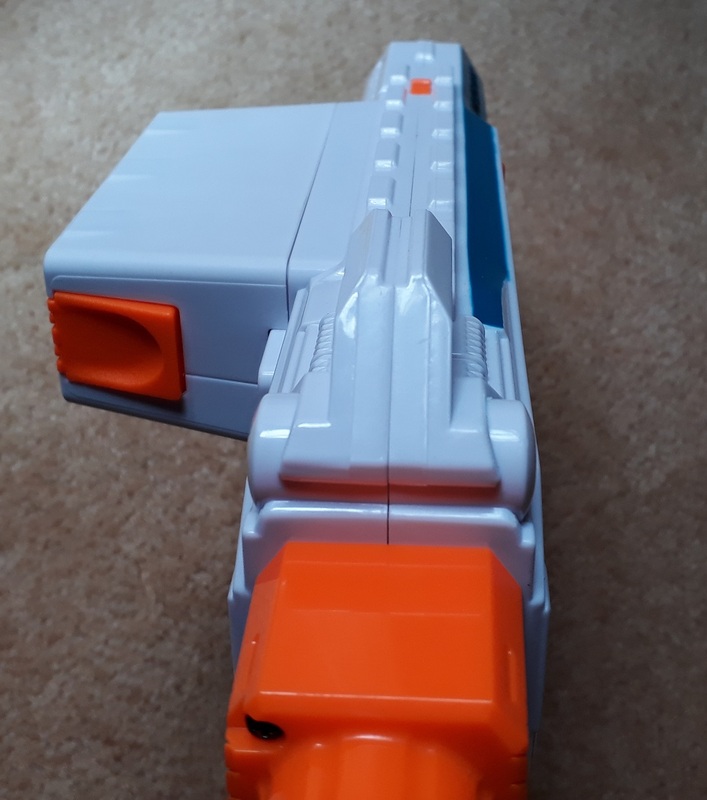 An effective and compact, albeit rather expensive, blaster. Everything in the Mediator package minus darts. 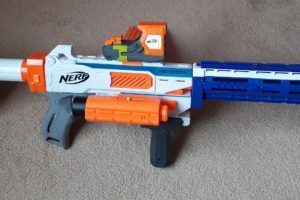 The Mediator is an interesting blaster, combining the size of the Retaliator with the pump action and side magwell of the Rampage. 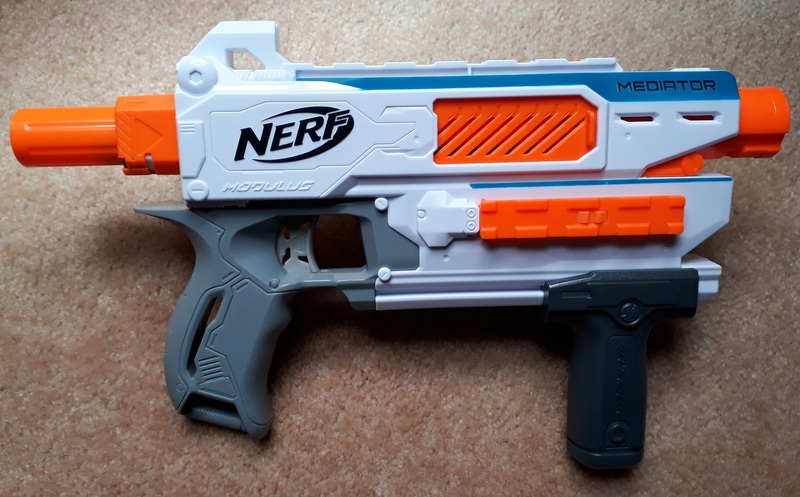 I was initially not going to bother having seen its retail price, but picked one up second hand for a more reasonable price. Right side of the Mediator. 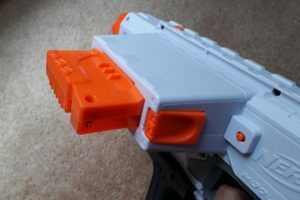 The Mediator is a compact blaster heavy on functionality. 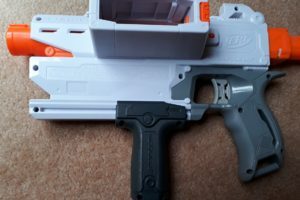 The pump is kept as close to the handle as possible, with the magwell moved to the side to accomodate. As is the trend nowadays, the left side of the shell is lacking in paint. 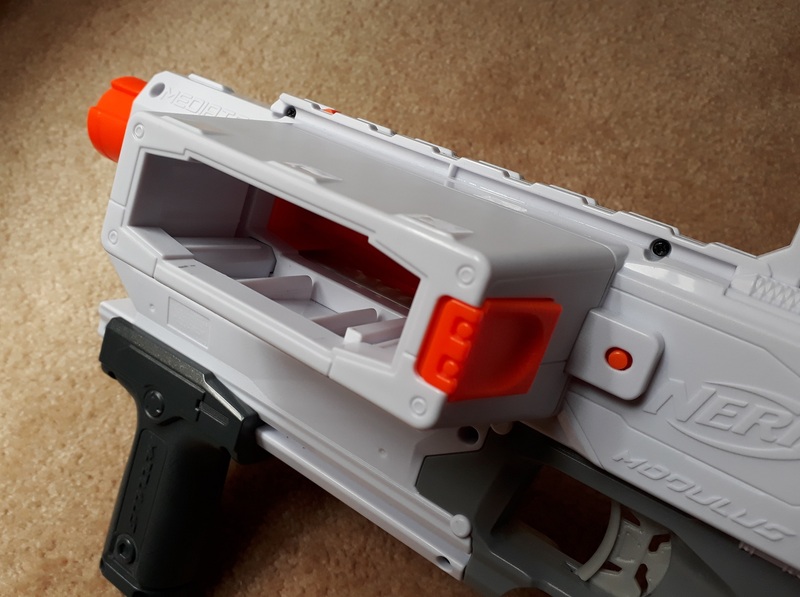 If not for the side mounted magwell, the Mediator is actually rather slim. Naturally, a blaster of this size is fairly light. 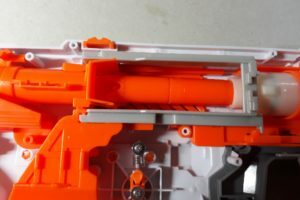 Close up of the top tac rail. 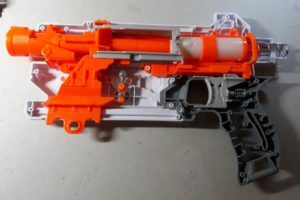 The blaster has been designed with attachment compatability in mind, being the only pump-action mag-fed blaster so far to take both barrel and stock attachments. 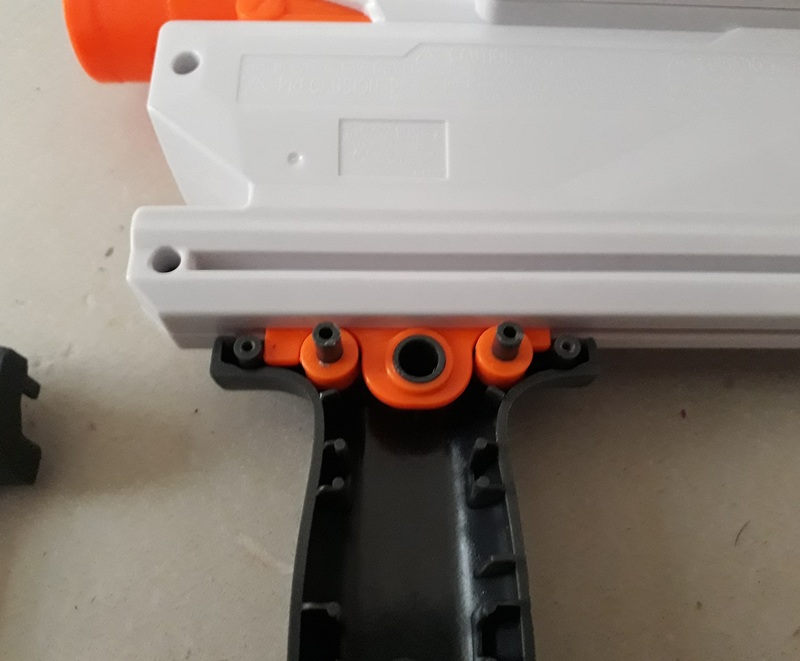 It also has two tac rails, one on top and one on the side. 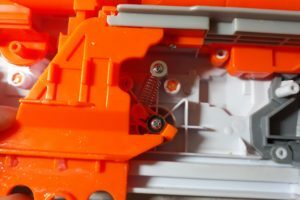 Close up of the main handle. 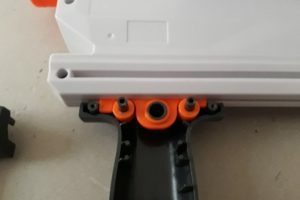 Close up of the pump grip and pump track. 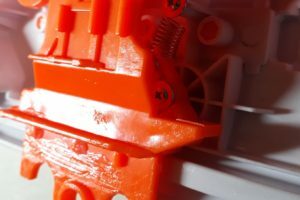 Pump in fully primed position. The Mediator’s main handle is quite reasonably sized and well shaped. 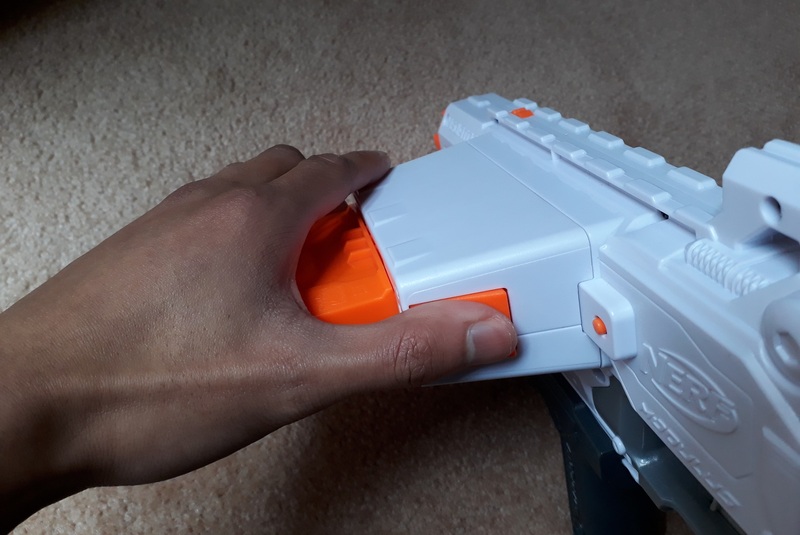 I personally find it very comfortable to hold. 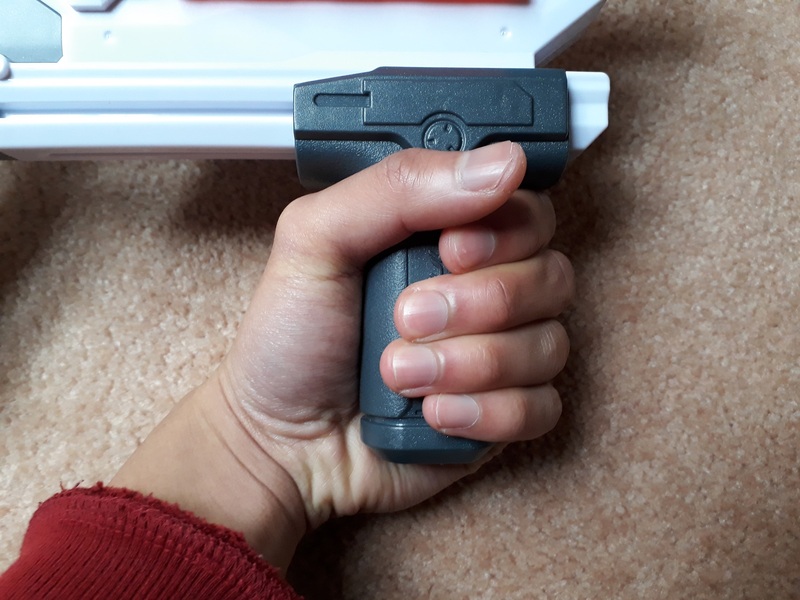 The pump grip is a little shorter however, and even with its width may be too small for users with large hands. 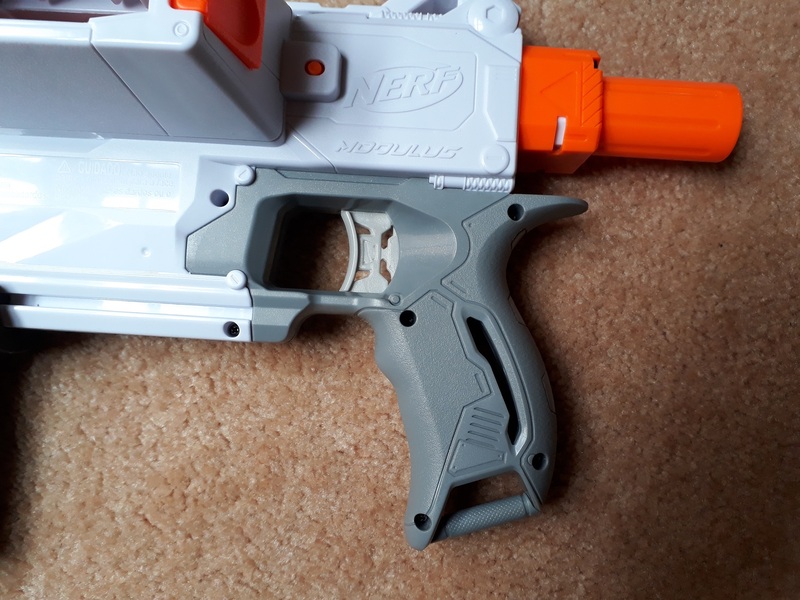 I also don’t like that the pump grip is completely vertical, and would have preferred an angled or even flat pump grip. 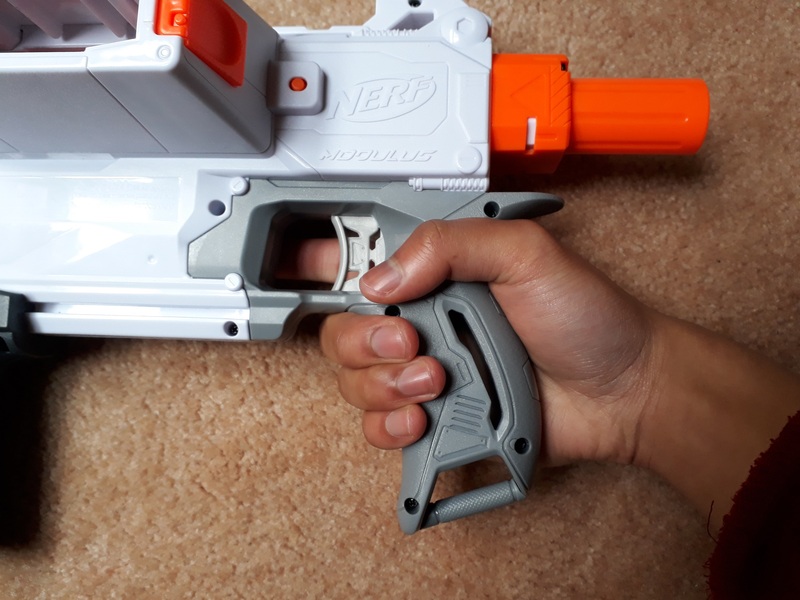 I personally feel that the pump grip is a little too low, and that it would be more comfortable to use if it was higher up, perhaps directly under the magwell. 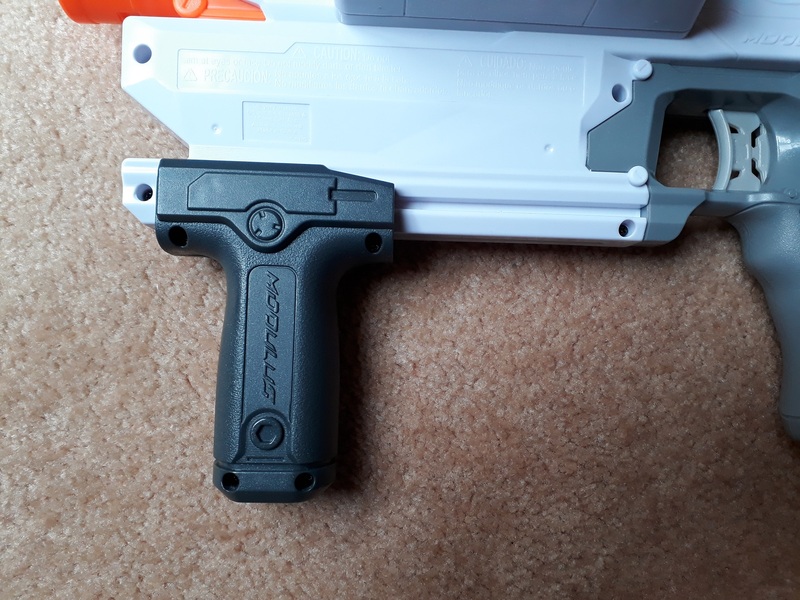 The Mediator’s left facing magwell is essentially the same as that of the Raider or Rampage. It is large and sticks out quite a fair bit, but is very solid. 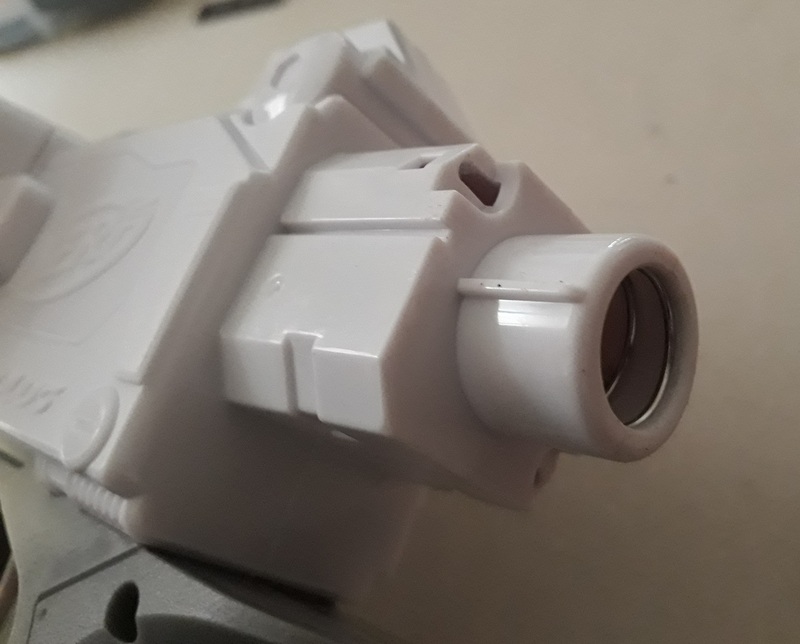 This is however one of the main downsides of the Mediator – a side magwell has some disadvantages compared to a downward facing magwell. 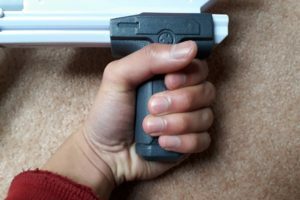 It is significantly harder for left-handers to use, and it can hinder maneuverability around obstacles. 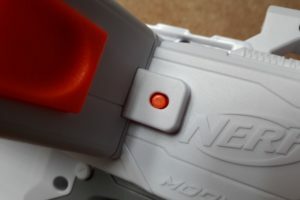 Close up of the lock-release button. 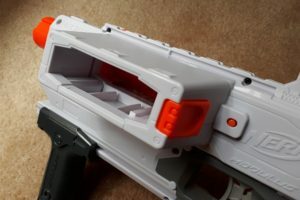 Again like the Raider/Rampage, the Mediator has a slide-open jam door. It can only be opened if the pump is all the way back. 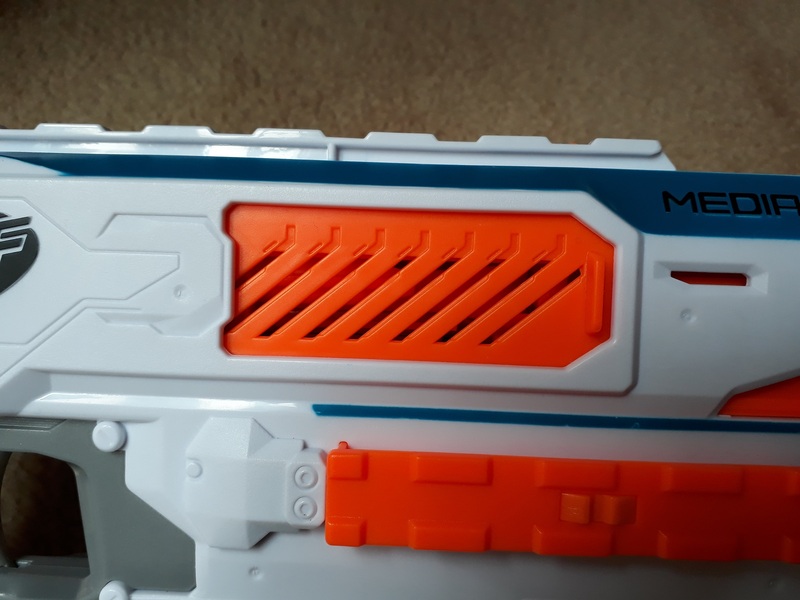 There is also a button just behind the magwell. 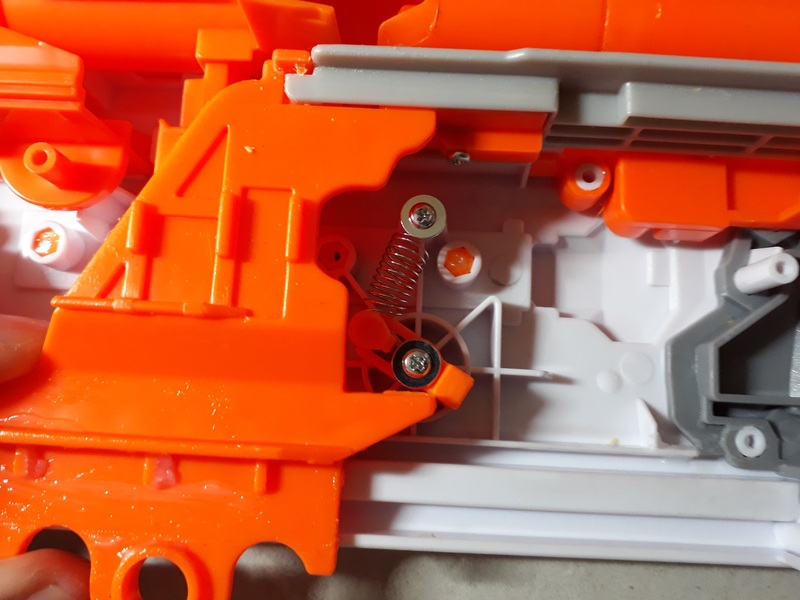 Normally, when the blaster is primed and chambered, the pump is locked in the forward position. 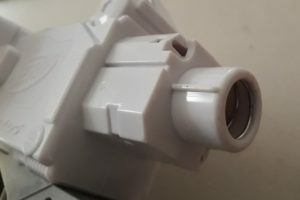 This button releases it, which can be helpful for clearing jams. 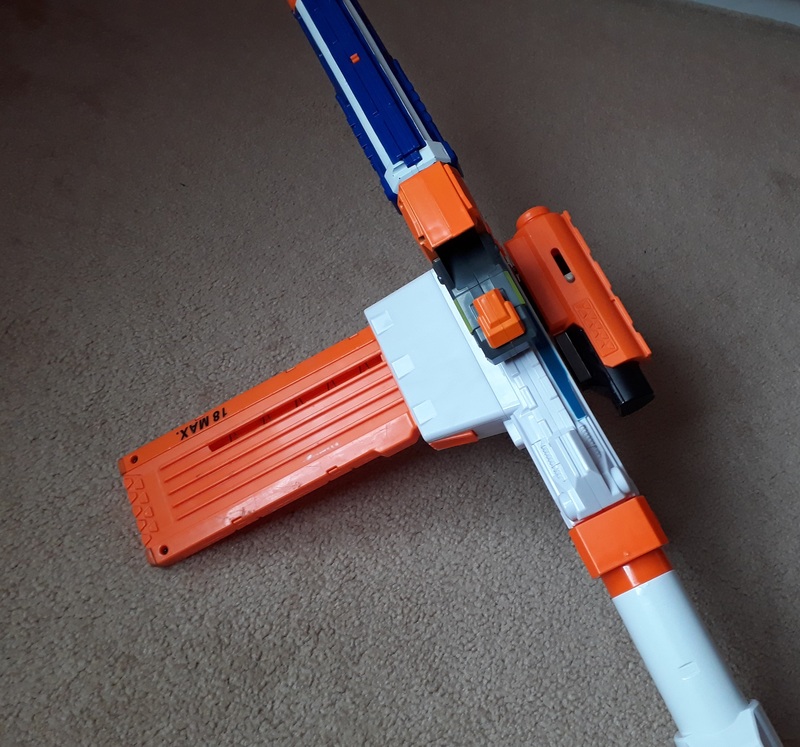 Mediator with a bunch of attachments. 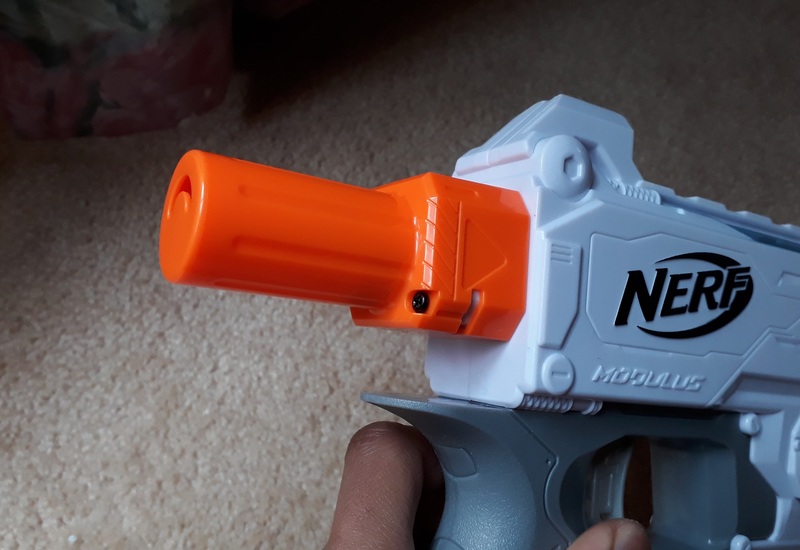 Another angle, with an 18-mag loaded. As mentioned previously, the Mediator has good attachment compatability. 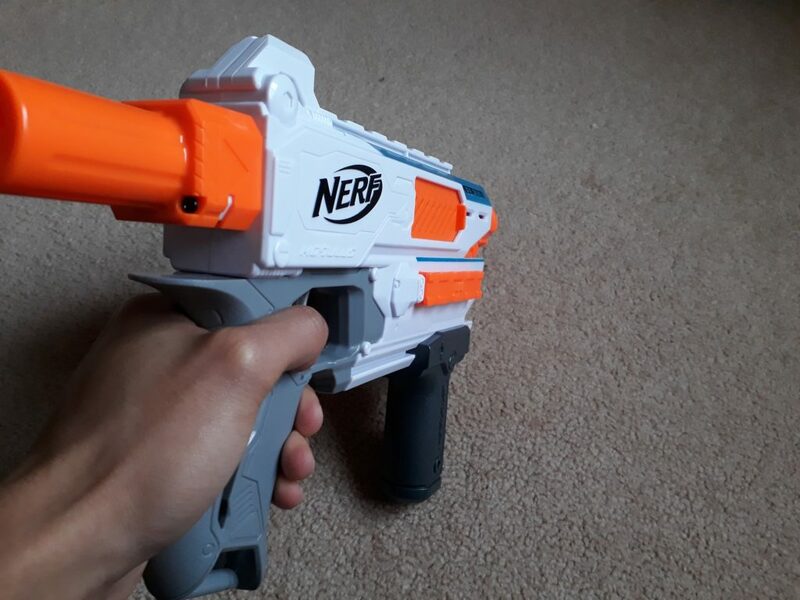 It can take barrels, stocks and tac rail attachments without issue. 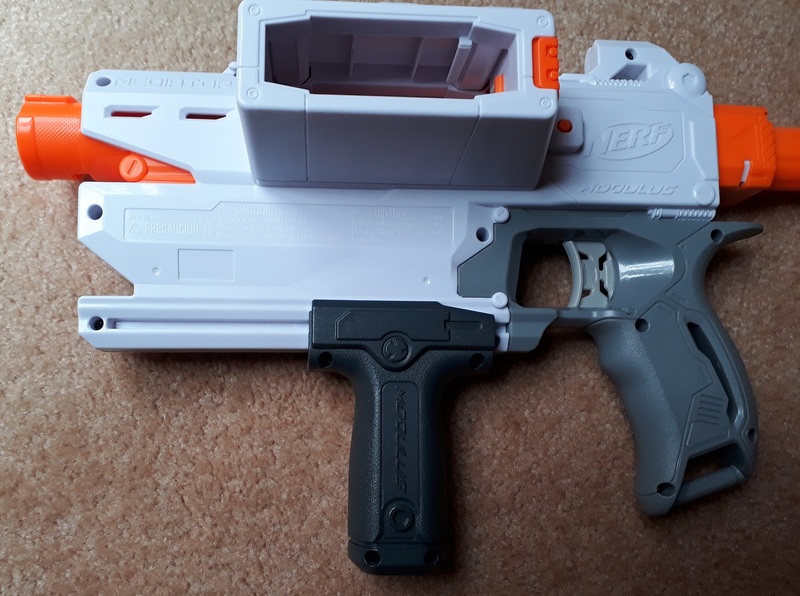 However, this setup really emphasises how cumbersome the side magwell can get. 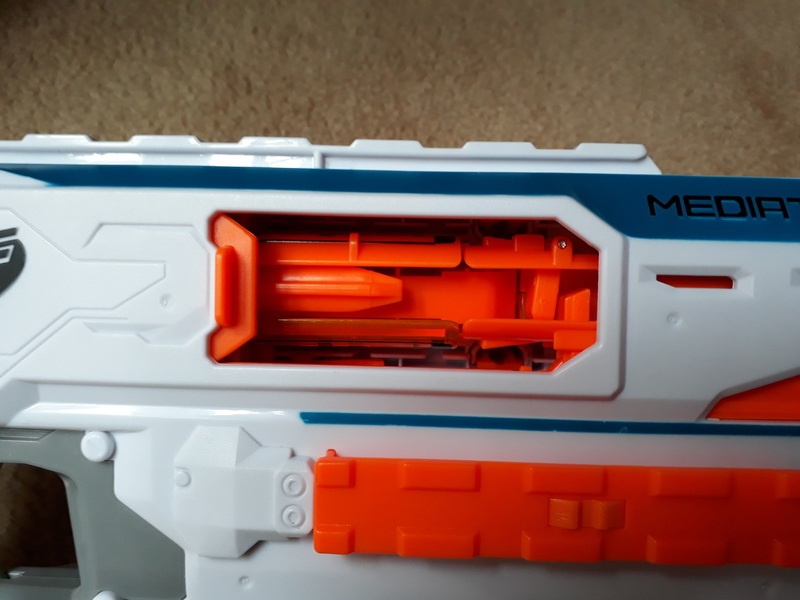 The 18 mag sticks out a good distance, and is just asking to smack into corners, trees, and other such obstacles. 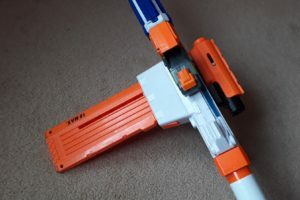 Mediator in the middle, with a Stryfe above and a Retaliator below. 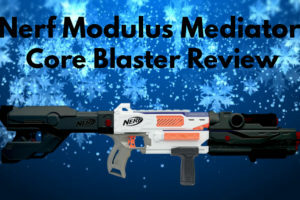 The Mediator is a fairly compact blaster, even with the incorporation of pump action. 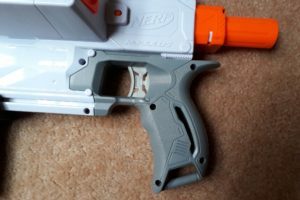 It is not much longer than a base Stryfe or Retaliator, though it has significantly more sideways bulk with its side magwell. First-person view of the Mediator. 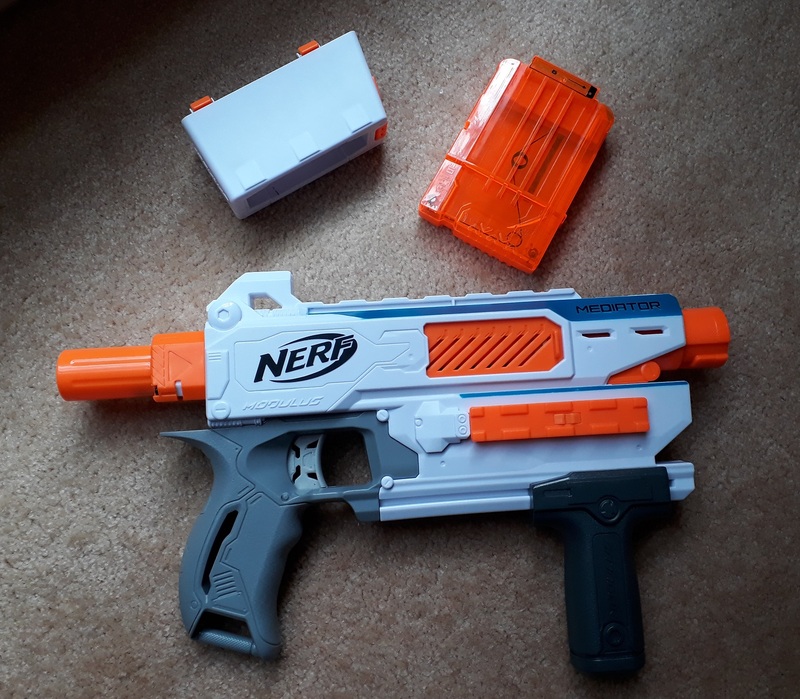 My Aus-spec, grey trigger Mediator averaged around 57fps with lightly used Elite-style darts. Range wise, this translates to around 9-11m flat. 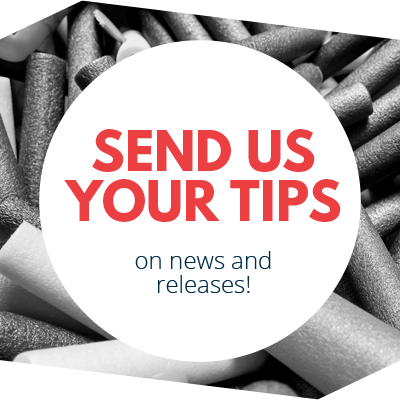 Accuracy is reasonable given it natively uses Elite-style darts. The majority of my test shots passed through my usual testing doorway. 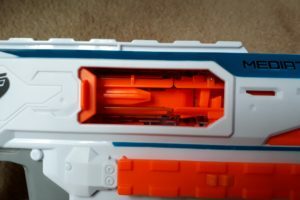 Naturally, this is heavily dart dependent and any good aftermarket dart will yield much better results. 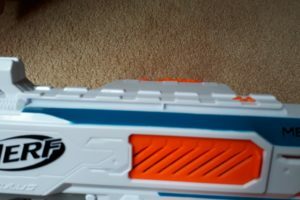 Rate of fire is quite good for a springer. 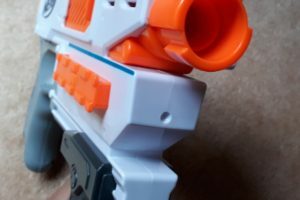 Thanks to slam-fire and pump-action, I was able to achieve around 6 darts per second at most. Note however that this ROF is highly impractical, not only having terrible accuracy and stability, but also seemingly having an increased rate of misfiring. 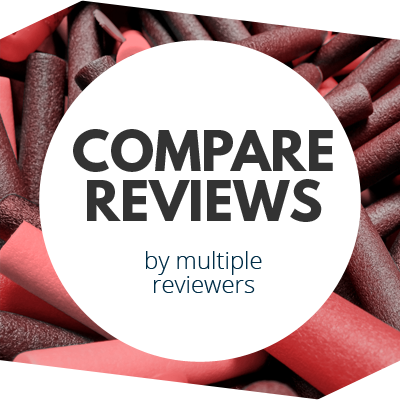 The Mediator is a compact pump-action mag-fed blaster, and is well rounded. 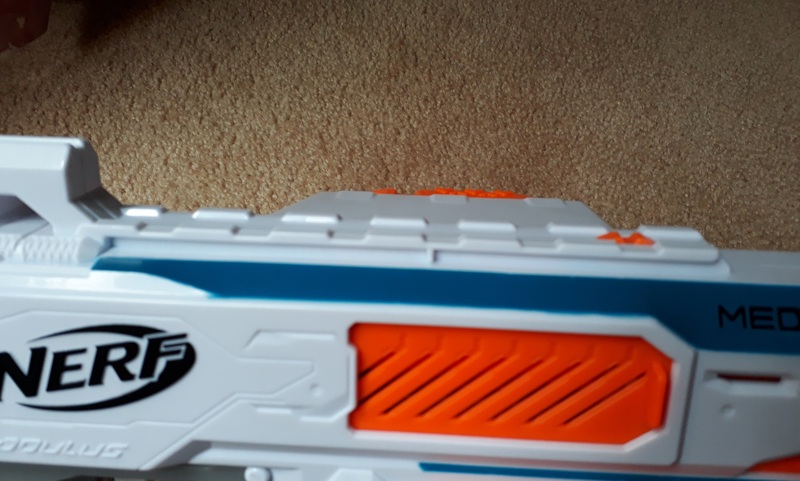 It has comparable power to other similar blasters, and quite a comfortable prime. 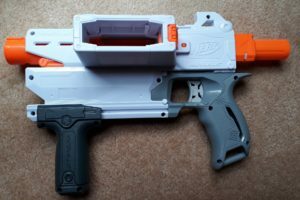 Pump-action and slam-fire allow it to reach surprisingly high ROF, giving it an edge over other springer mag-fed blasters. 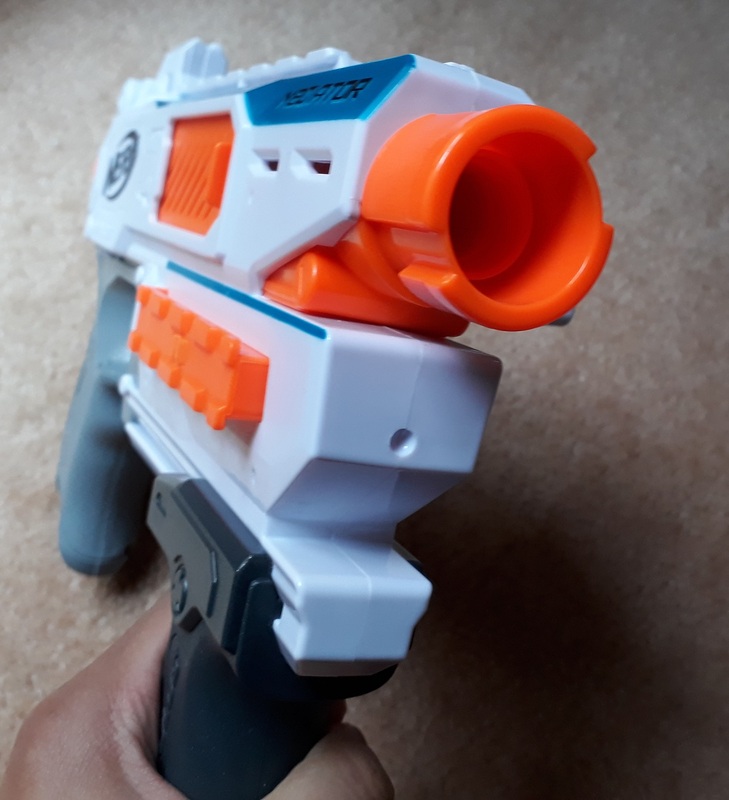 Normally, a blaster this small would also lend well to close-quarters use. 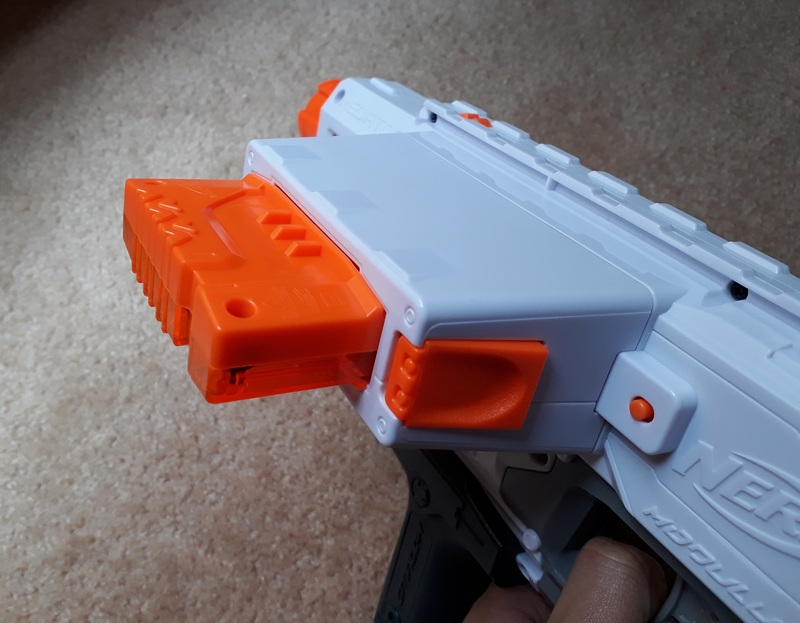 When using larger mags however, the side magwell can hinder maneuverability, particularly with regards to turning corners. Nonetheless, it is a fairly effective blaster in most situations. 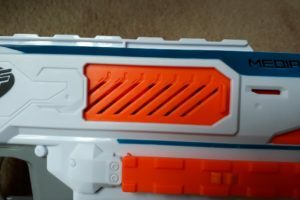 In Australia, the Mediator retails for a ridiculous 35-40AUD. 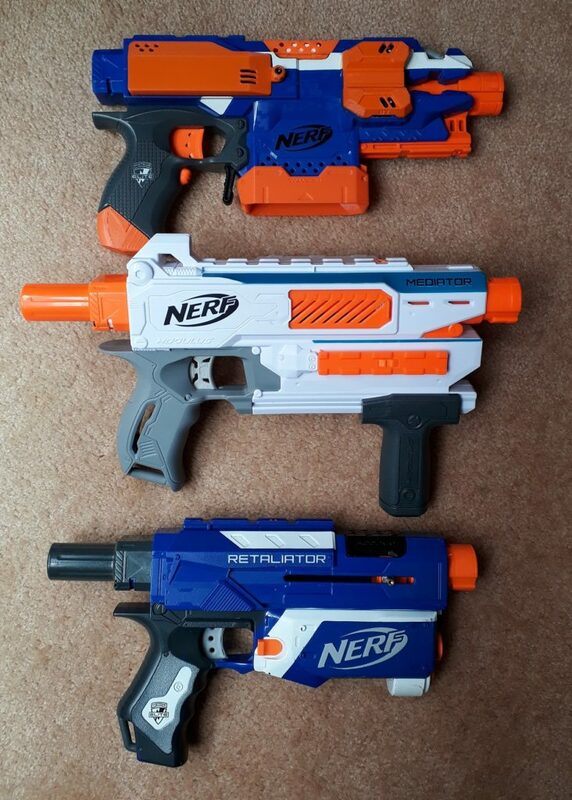 Both Alpha Troopers retailed for just 30AUD, while the Retaliator can be found for 30-35AUD. 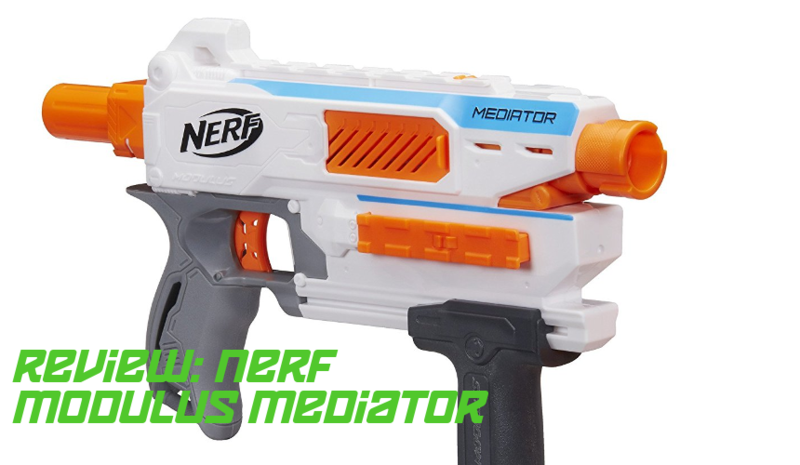 While the Mediator is a solid blaster, I feel that its retail price is too high for what it offers and includes. Although good, it is not at all exceptional, and I would only recommend picking it up when significantly discounted. 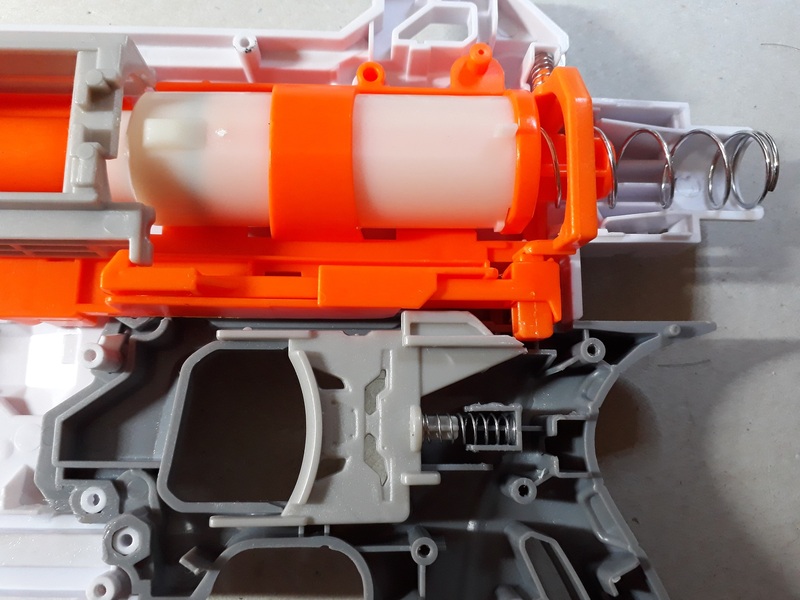 Half of the pump grip removed. 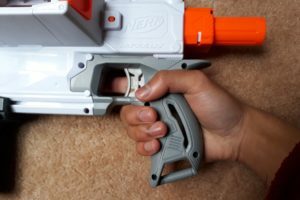 The Mediator’s pump is attached through a single loop, sitting in tracks along the sides of the shell. 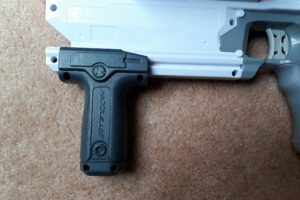 The stock attachment point is different to what is typically seen on mag-fed springers, though it performs essentially the same job. Overall of the Mediator internals. 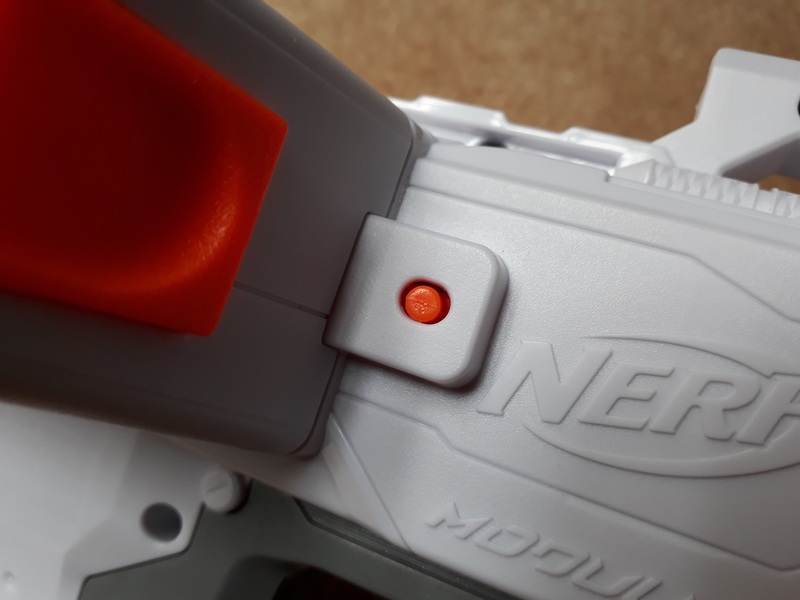 Close up of the plunger and trigger. Close up of the bolt. 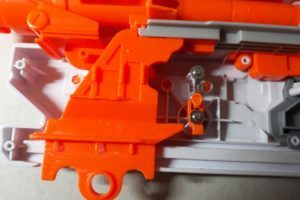 A look at the magwell-side locks and mechanisms. 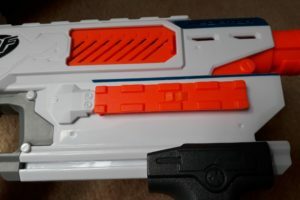 The Mediator’s internals are pretty standard if you are familiar with Elite-era mag-fed springers. 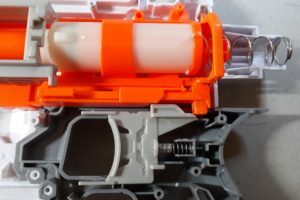 As far as I can tell, the plunger tube is the same as all of Nerf’s other recent mag-fed springers. Close up of the pump area. 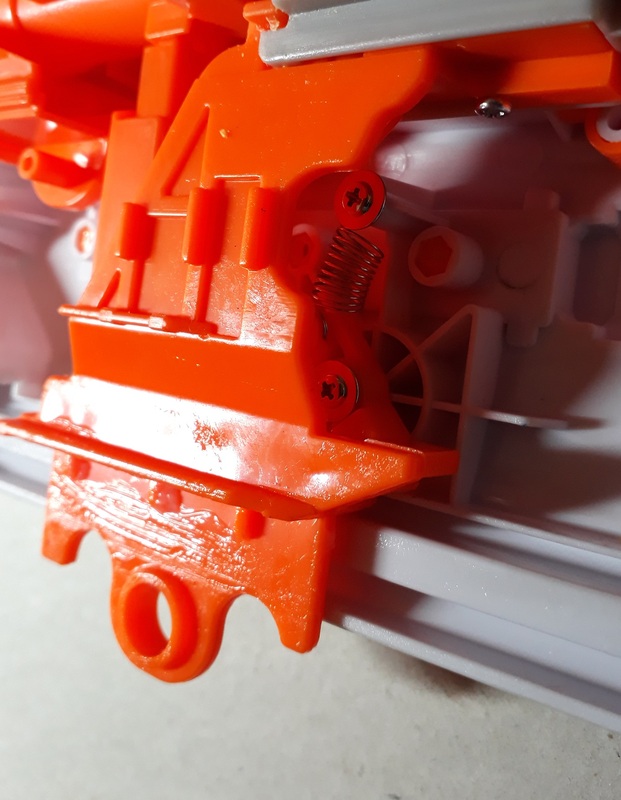 Pump ratchet in lock position. 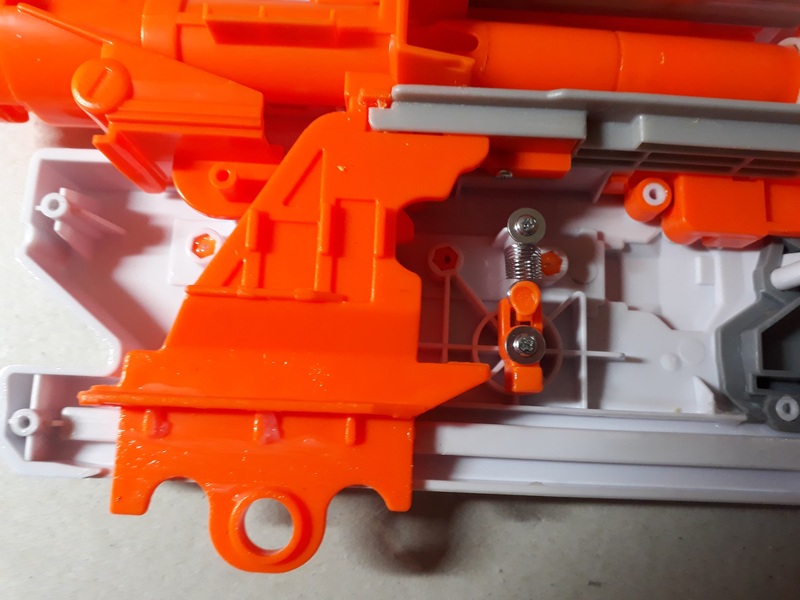 Though bulky, the pump linkage is also fairly ordinary, with the exception of the ratchet. 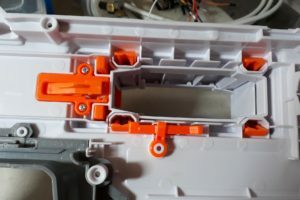 This ratchet ensures that the pump can only be moved in the correct direction – backwards if the blaster is unprimed, and forwards if it is primed but not yet chambered. Though useful to prevent double-feeding, it is also very loud and not really necessary for experienced users. I personally removed it from mine and have had no issues. 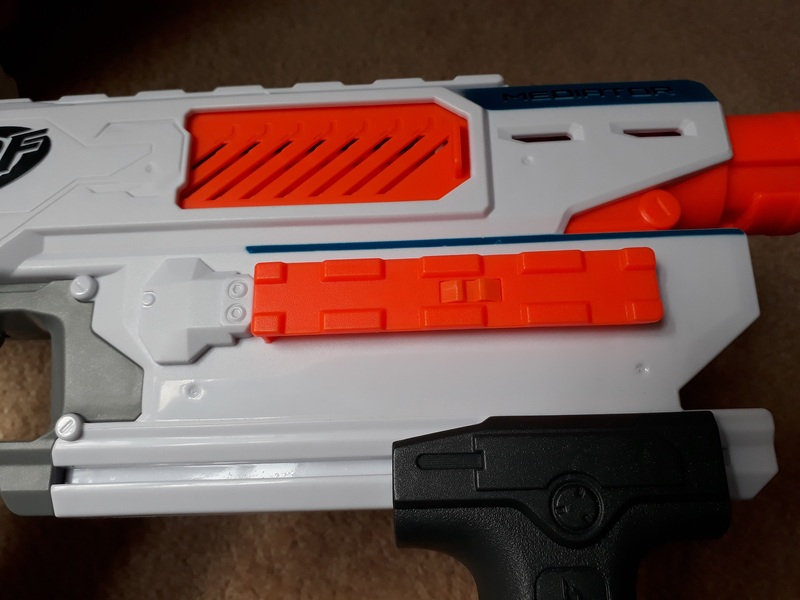 Mediator stock spring on right, typical Elite spring on left. 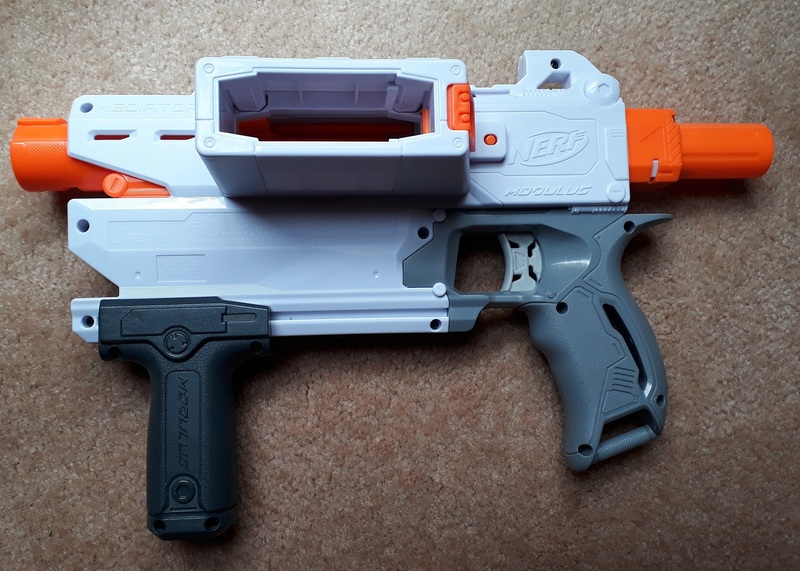 The Mediator’s stock spring is a little longer than that from other similar blasters, though with locks removed, works just fine with the same upgrade springs. 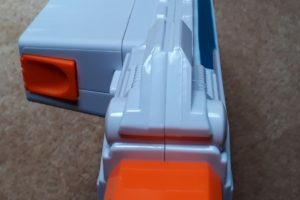 This entry was posted in Dart Blasters, Reviews and tagged australia, grey trigger, mediator, modulus, nerf, review on July 21, 2018 by Outback Nerf. They seriously charge you 35-40 AUD over there? That’s anywhere from $25-30ish in USD, meanwhile they only charge $19.99 over here in the States. 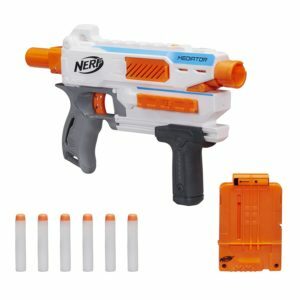 What the hell, Hasbro/stores that sell Nerf?